The plasmid Alb e/p containing the mouse albumin promoter/enhancer promoter sequence was digested with EcoRV and SAP. 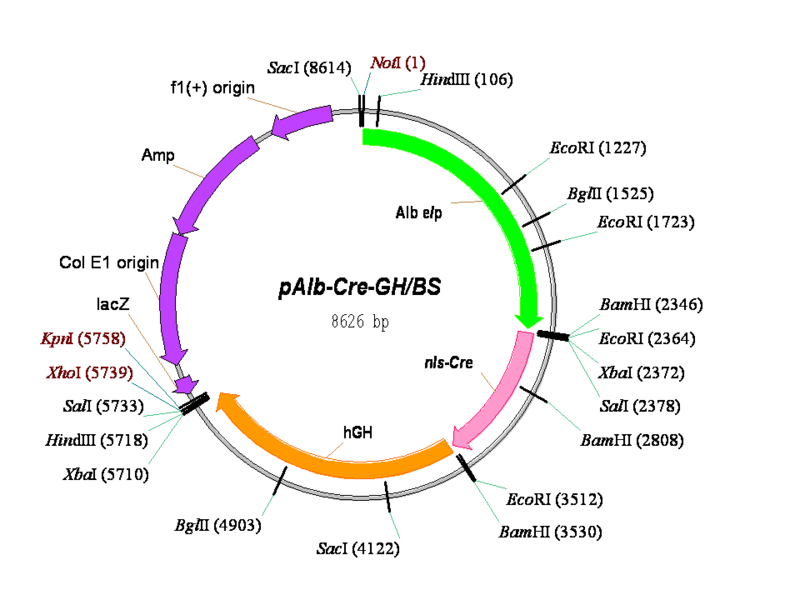 pBS/RIP-Cre-GH was digested with Xba I to retrieve the ~3.3 kb nls-Cre-GH fragment which was subsequently filled-in using Klenow and ligated into the EcoRV site of Alb e/p to create pAlb-Cre-GH/BS. The final construct was digested with Not I and Kpn I to retrieve the fragment used for microinjection. Note: Alb e/p (enhancer/promoter) was originally obtained from Richard Palmiter.